During the conference, sponsored by the oil company Chevron, US Undersecretary of State Victoria Nuland reported that, since 1991, her country had invested in Ukraine, which is one of the most strategically important countries, more than 5 billion dollars. She added that it was done not to eradicate poverty. 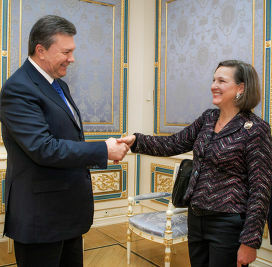 A few days before there was published the telephone conversation (some believes that it was done by Russian secret services) between Nuland, known for her anti-Russian views, and the US ambassador to Kiev, during which she strongly advocated against the EU because of its failure to overthrow the Ukrainian Government. She reported about the usage of a representative of the United Nations (an international organization that plays the role of a puppet) to form a new cabinet. All of this only confirms the assumption that Washington is behind the coup d’état directed against the legitimate (by the way, by Western standards) government of Viktor Yanukovych, who was elected in 2010. Of course, no one would call it a coup, because otherwise it will be impossible to recognize its legitimacy. The same thing happened in Egypt, when the coup was committed by soldiers led by Assisi. On the other hand, it was surprising that Barack Obama has exhorted the protesters to remain calm and to communicate with the government, when such “hawks” like John Bolton and Senator McCain (who personally went to Kiev on Independence Square), urged them not to make any concessions. Is there another neoconservative government that contemporizes with the Obama administration or the president himself playing a double game? The reality is much more complicated and does not fit in the statements such as “Ukrainians want to join the EU, but their dictatorial government decided to prevent this by force.” While the media present the internal affair of Ukraine as an international issue, exaggerating its implications in order to facilitate the intervention of the Western powers (which were concerned with the state of democracy in Ukraine, not in Saudi Arabia! ), no one knew about the Thai Prime Minister Yingluk Shinawatra escape because of mass protests, or the massacre of Muslims in Myanmar. Monopoly on interference in the internal affairs of other states has its own name – the American exceptionalism. Now it is scientists deal to learn the culture medium, which spawned a crisis of this magnitude, and to find out how 20 thousand people were able to determine the fate of 45 million. It’s at least unconvincing to talk about the sound of the silent majority! It looks inconceivable that some “revolutionaries” put their lives in danger in order to join the Economic Union (EU), which is experiencing an acute crisis with millions of unemployed, the disadvantaged and impoverished middle class. The EU and the US have tried to take advantage of the technology of the “Arab Spring” in its Libyan and Syrian versions: peaceful protest, in which suddenly begin to participate armed groups with military discipline, disseminating chaos and terror and causing thereby a sense that there is a threat of massacre and civil war over the country. And if dictators go on violent suppression of the riots, it means that they do not express the interests of citizens. Offset of Yanukovych using such methods is a bad precedent for the European governments, facing almost daily tens of thousands of protesters against corruption and plunder their savings. 1. The EU suggested to the Government of Ukraine not membership, but free trade agreement, which would destroy the country’s economy, which has one quarter of the black soil in the world (these soils do not require fertilizers), as well as reserves of coal, uranium and iron ore. Its impoverished population thinks that in this part of Europe people live as in Sweden, not knowing that, for example, in Belgium, one in four children lives in poverty. 2. At the present time, being in crisis, the EU is not interested in Ukraine joining. If the Ukraine would be taken, Georgia, Azerbaijan and Moldova would apply for admission as well. 3. Such countries as Romania and Bulgaria, which have already joined the EU, have not seen any economic prosperity or political rights and now they are in worse state than 40 years ago. Socialistic Bulgaria has exported electricity and agricultural products to Turkey, but now its economy is in such bad condition that thousands of its skilled professionals were forced to emigrate. The country itself is living solely through imports and a huge debt. 4. In Belarus, which is the member of customs union as well as Russia and Kazakhstan, the level of poverty and unemployment is 2%, while education and health care are still free and universal. 5. Brussels and Washington support the most reactionary right wing in Ukraine, fascist groups (as they had supported the Taliban and “Al-Qaeda”) and even anti-Semitic groups, which accuse the government that it was “a puppet in the hands of the Russian Jewish mafia”. The communist parties of the former Soviet republics warned of the danger of neo-Nazis in the Ukraine in December last year, which is also gaining momentum in Western Europe. – Not to allow Russia to create the Eurasian Economic Community, the core of which was supposed to be Ukraine. The community had to start working in 2015. 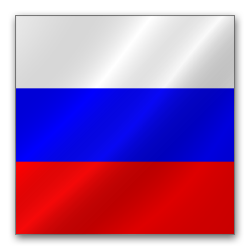 – To keep the successful strengthening of Moscow in post-Soviet space, in particular, in Eurasia and Central Asia. – To take revenge on Putin for failing to give Snowden, who caused serious damage to the United States, as well as disrupt the Sochi Olympic Games, in which Russia has invested $ 50 billion. These Olympics were supposed to demonstrate the power of Russian sporting and organizational possibilities. – To weaken Russia so that it could not resist the United States in other disputed areas. – To open the Ukrainian market for Western goods, knowing in advance that Ukrainian products are uncompetitive. – To call the nervousness from the Russian government, to make it think about the next strike. – To present Russia as anti-democratic country where human rights are violated, and to present the West as the heavenly abode, although in reality rotten elite is in power in both sides. – To strengthen its position in the new Europe, because now West Europeans cease to be obedient executors of Washington’s orders, as well as prevent the creation of the Paris-Berlin-Moscow axis. Do not forget that Germany refused to participate in the Iraq invasion in 2003. In order to involve Ukraine in its orbit, the US developed several plans. The plan is to bring to power an anti-Russian government, which will act as a counterweight to Moscow, and will ensure the country’s entry into NATO, as it has happened in Poland, Hungary, Slovakia and Romania. The promotion of NATO to Russia’s borders was suspended after five-day war with Georgia, when Russia took the civilian population of South Ossetia under its protection. The coup d’état directed against Yanukovych facilitates the following primary objective: to change the leadership of the security services and the Armed Forces of Ukraine and redirect them to the Pentagon. If the future regime will not appear to be friendly, it should at least turn Ukraine into a buffer state between Russia and the West. US prefer a weak and unstable Ukraine to strong state, which has partnerships with Russia. The United States also will carry out a new policy: no interference and undue risk; maximization of the benefits of the social problems existing in the areas of Washington interest. Since independence of 1991, Ukraine by virtue of its geographical location had to maneuver between the West and Russia. Examples include the failure of Yanukovych from the Russian proposal to merge Ukrainian Naftogaz with Gazprom in 2011, despite the fact that Gazprom would supply gas at a lower price and the case of simultaneous negotiations concerning a partnership with NATO and the signing of the contract of leasing the naval base in Sevastopol to Russian Black Sea Fleet. He will decide whether Ukraine wants to become the second Cyprus and Greece in the European Union, or to become Russia’s strategic partner. The choice of the future course will provide crucial long-term national interests, which excludes the absolute loyalty of Kiev to Moscow and to the West. Germany has 287 US military bases on its territory (for example, in Norway there are three of them and in Spain there are five ones), that’s why it has become a hostage of the US, and Chancellor Merkel had to go for an audience with her superiors in Washington about twenty times. – Spreading its influence over the Black Sea and getting the access to the Middle East via the Balkans. In 1917, Germany demanded the Bolsheviks to concede Ukraine in return for the world which they needed. Hitler also dreamed that Ukraine, Belarus and the Baltic republics would be ruled by Germany. 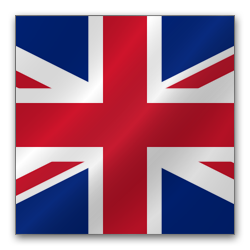 – Filling the vacuum that would form after the withdrawal of the US from different parts of the world, despite the fact that they continue to operate weakened and fragmented Europe. – The economic benefits of Ukraine (where the best agricultural land in Europe, cheap and qualified labor force, and professing Christianity) must exceed the potential damage from the weakening of ties with Russia. In addition, we should not forget that Europe is the largest trading partner of Russia. Russia will not allow setting a pro-Western regime in the country, which play a key role for its security. Where and how it will respond to these provocations? Maybe it will be done in Iran, undermining the historic agreement with the US on the nuclear program of the Islamic Republic, in Poland or in Romania, which depends on Russian gas supplies. Russia expands its Black Sea coast line through Ukraine, strengthens ties with more than 4 million Orthodox, maintains a military base (which may also be a military air) and has the access to abundant agricultural production. Kremlin authorities cannot lose this battle, but at the same time it does not want confrontation during the Sochi Olympics, therefore it uses its soft power. Obviously, any government of Ukraine will have to observe the balance the interests. Ukraine economic dependence from Russia is so great that Russian citizens are the owners of many Ukraine large enterprises. Current events are changing the balance of power. Belarus can become an another object of “controlled chaos”, and then it would be regions of the Russian Federation. « The Northern Territories Impasse, Russia and Japanese Dependence on the U.S.